Every time we see a home with trees around it, we find it very pleasing and beautiful. Aside from that, we can also feel the warmth of nature. Anything that is connected to nature will certainly make us feel better and more at home. It makes us feel relaxed as we are also able to de-stress too. 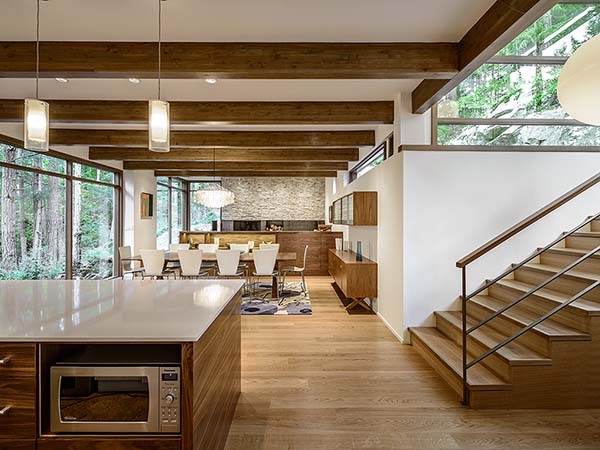 This home that we are going to show you today has a natural feel in the house as it used wood but could give the homeowners a modern way of living. 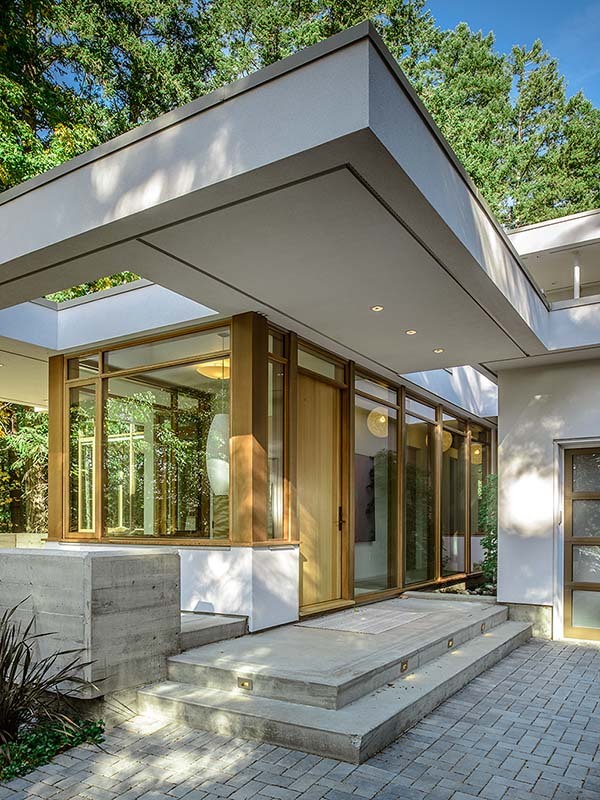 This custom modern home is called the Fir Tree Glen House located on a wooded landscape in Victoria, British Columbia, Canada. It showcases gorgeous clean lines, floor to ceiling windows, hardwood flooring, and open wooden beams. All of these contributed to create a fascinating residence. 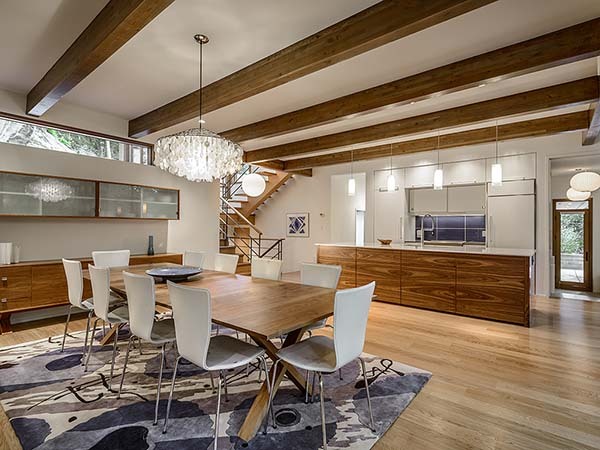 The home has an overall modern but the interiors are warm and inviting because wood is utilized in the furnishings, finishes and materials. It also used area rugs to delineate spaces. Meanwhile, the private areas and public areas are separated on different levels. The concept of the home offers an open concept floor plan that allowing fluidity and is perfect for entertaining. 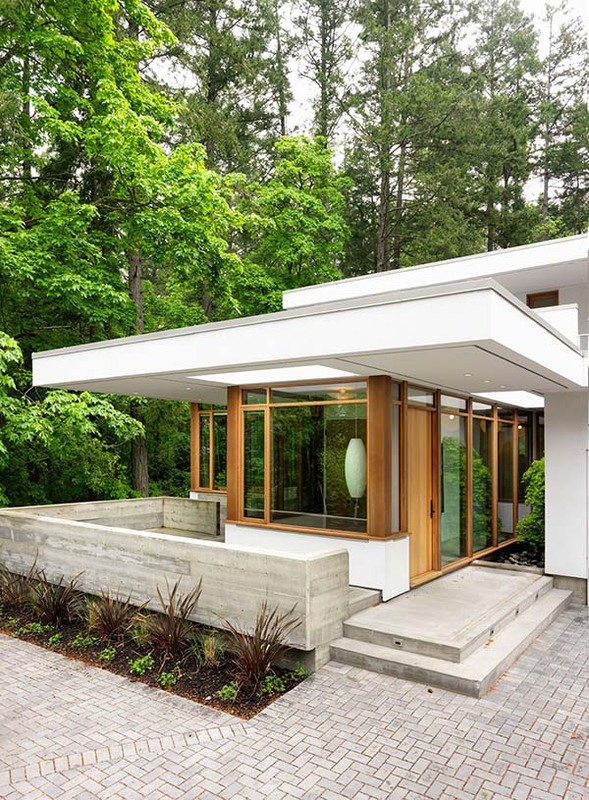 The modern house looks amazing with the colors and geometric lines in it. 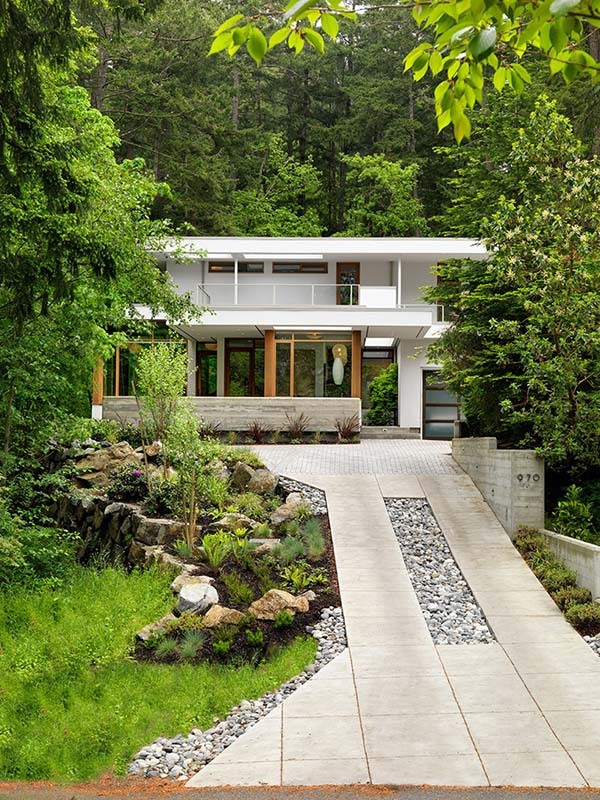 Take a look at this house with the trees as a backdrop. Isn’t it mesmerizing? It used a combination of materials from wood to concrete as well as glass. For the fireplace, it is comprised of metal which is a 1.4 inch plate steel that has been treated with an acid wash. The color scheme of the house is very beautiful as you can see in the dining and kitchen areas. A decorative chandelier made of shells adds more glamour to this dining space which is defined by the beautiful area rug. 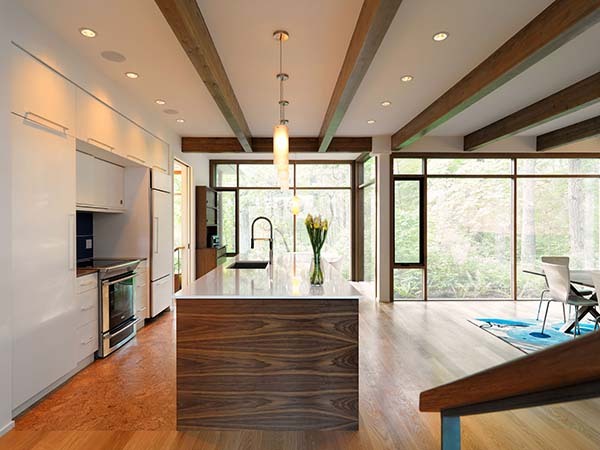 You can see here wooden beams on the ceiling that matches with the wooden flooring and furniture. 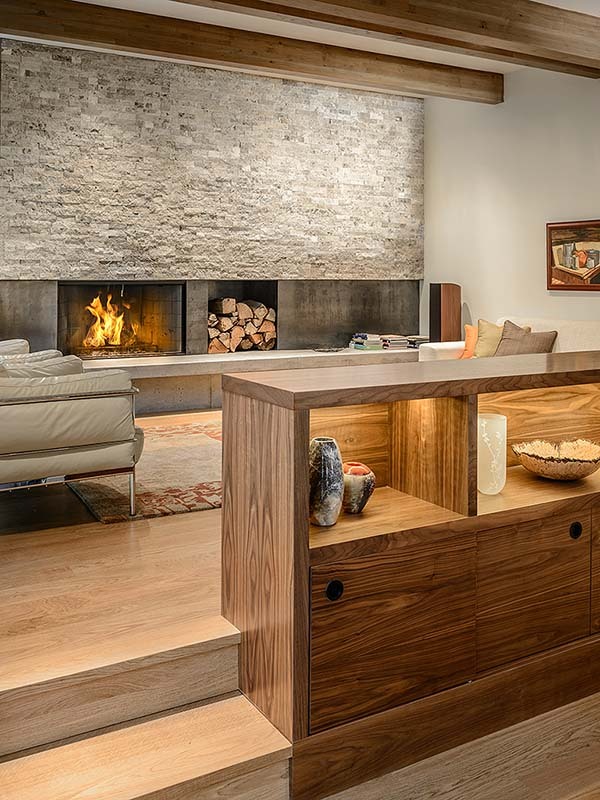 The kitchen island is made of walnut plywood veneer that has been book matched for grain. Isn’t the grain of the kitchen island lovely? I love its contrast with the white counter top. In this area, you will feel like you are connected with nature because of the glass walls that surround it. 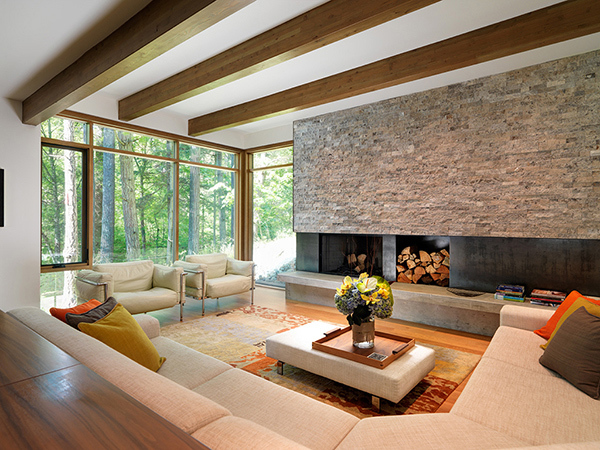 The wall of stone above the fireplace is a hand cut travertine. The bedroom looks very calm and relaxing. It would be nice to be able to see the trees from your own bedroom. 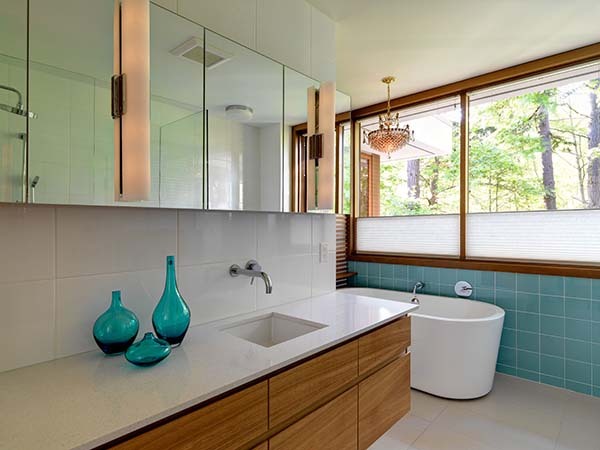 The bathroom looks beautiful too! 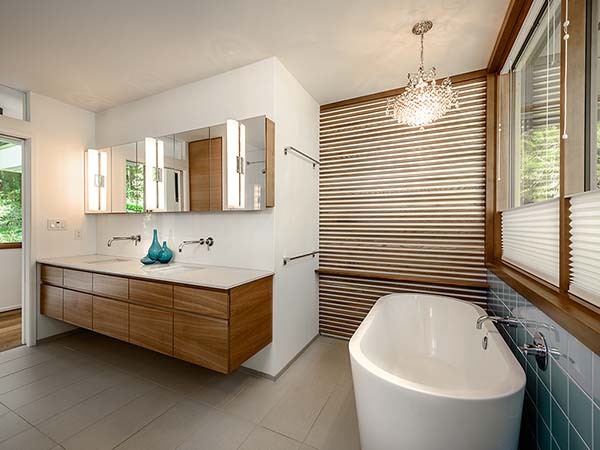 The round tub adds a contrast to the edgy look of the vanity and mirrors. The mirrors allow more light to bounce inside the space as it is illuminated by natural light and the chandelier. 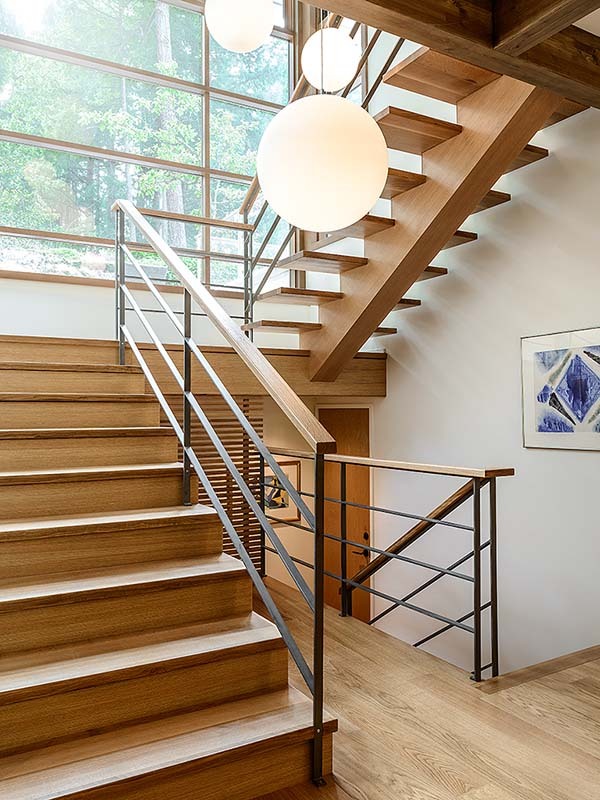 This is the staircase made of wood and steel connecting the different levels of the house. Don’t you just love the look of this home? It is really something that most of us would love to live in. I like that is combines a natural feel with a modern design. 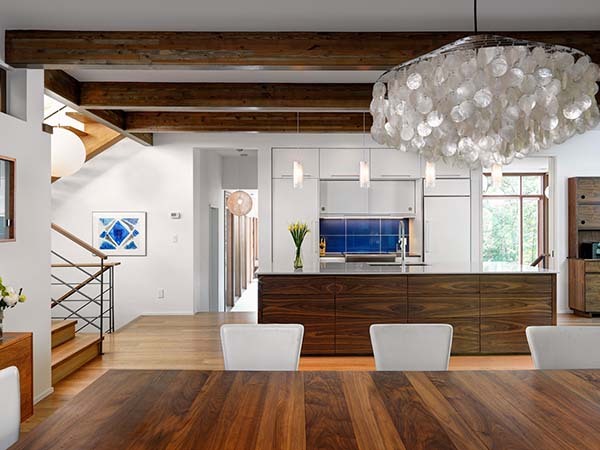 Such a mesmerizing home indeed from Horizon Contracting! 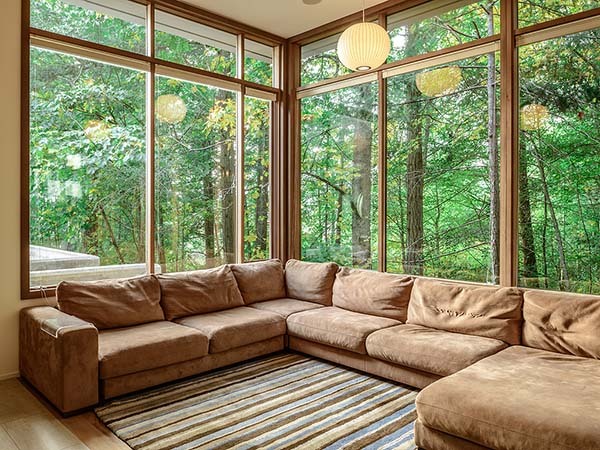 I love the entire look of the home especially how it is surrounded by trees and yes, nature!